Why Ethiopia has practically only one International Airport? The political leaders in Ethiopia are really greedy and selfish. They kill their country men to take power. They use the political power to enrich themselves. In Ethiopia there is only one international airport practically. An this is Bole Addis Ababa Airport. Evry one has to stop over or spend a night or more in Addis Ababa, Ethiopia's capital, which has got attention recently due ethnic cleansing. The Oromos were killing non-oromos in the hope to to make the majority Oromo whereas it could have cheaper to build another city more beatiful than Addis Ababa. Ethiopian airlines, so-called national carrier has been flying to other countries in Africa and all over the world to make profits and make more money. Where is the people of Ethiopia are not able to have direct flights from major cities of the world to places like Mekelle, Bahir Dar, Jijjiga or Awasa or Diredawa or Lalibella or Gondar or Aksum. Some of these T towns are much more beautiful than Addis Ababa. Most of the Ethiopian passengers flying from with Ethiopian Airlines from Europa or USA are not from Addis Ababa. Mos come from the provinces. Ethiopian Airlines should has been cheating the world by opening international airports In Mekelle and Bahir Dar which practically are not. Ethiopian Airlines is investing in African Airlines. Ethiopian Airlines shuold practically services to Mekele City or Bahir Dar or Jijjiga or Awasa instead of investing millions in African countries. Somali of Jijjiga are more important to Africa and Ethiopia than Zambia, which Ethiopian #airlines has been working with. Ethiopians are exploited and the country has non-existing international airport except one in the capital city, which is [deleted] for many Ethiopians who happen to be non-Oromos. Re: Why Ethiopia has practically only one International Airport? Because no one trusts anyone, everyone lyies and every one knows there is no united country as one citizen but everyone believes the country will be disintegrated eventually any time. Ethiopian Airlines is now an International Company. Don't keep all your chicken in one basket, especially in the third world. On a small scale example: Companies were starting to invest in Bahirdar, Gonder...but since the burning down of investments, now even Industrial Parks are having doubt and stayin Debrebrihan area. In Africa and Black dominated cities in USA, you have to think twice, unless there is banks and governments that guarantees no hussle compensation. You have shown us your true colours! You are Eritreans working to destabilise Ethiopia, rob it;s riches and companies. We have 6 international and 11 national airports in my country Tigrai. Eat your hearts out ugum shabo! Boycott Ethiopian Airlines. Fly our Tigrean Airlines. 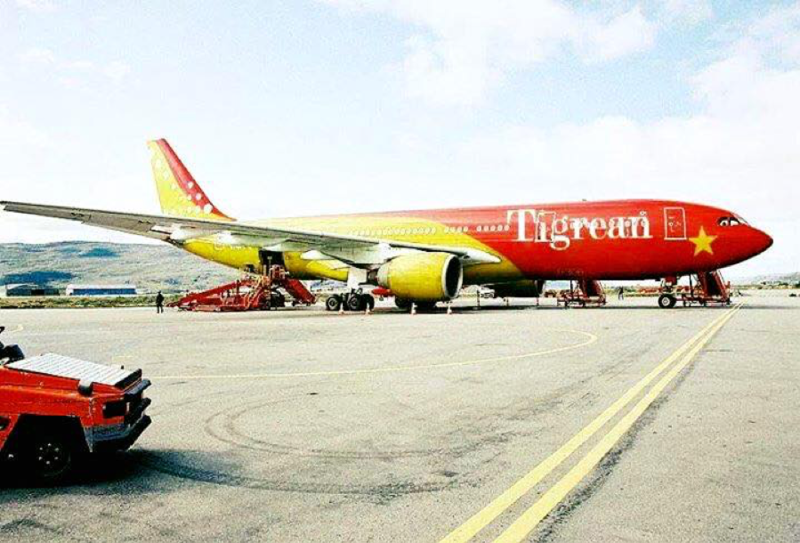 If you fly our Tigrean Airlines you will be qualified to win a FREE 3 weeks vacation to our Awash Tigrai Park. Now that is a deal you cannot resist. Yes, Tigray should have it's own airline. Ethiopia is unstable and roads leading to Tigray have been closed and stuff in lorries has been ransacked by Amhara Regional Government authorities and Amhara youth. Tigray to have an international air port to facilitate import and export. We need supply of medicine and food from neighbouring in case Addis Aba is planning to starve the Tigray population, which is possible as past historical evidences show. Tigrayan Airlines a good name, an original, Geez name meaning a lot of things and connecting it to Asian countries. Privat Tigran investors and friendds of Tigray people might invest in such an airline. This realy gives Tigray ore independence in regulating it;s economy and more money to finance it;s economic projects (heavy industry, automotive industry - whic was started 30 years ago). A show coming to a website, theatre, cinema, conference halls...near you. Based on facts from Archives and documents not teret teret that will disappear like the teret terets disappearing daily. Another false accusation to soon disappear and be reversed..